Well, I'm doing it again...posting a short by a writer who was already posted. Ray Collins' stories are gems. I wish I had a better showcase because they deserve it. Substance. Heart. Stuff stories need. Guess times really are changing. As Ray says, "I don't think the ME Generation could survive a Great Depression, but it looks like they may soon get a chance to find out." Ray says this story is based on fact. He says,"My sister told me about my brother in 1996 and I had to write it in '97. I remember the day in 1937." A hot summer afternoon yawned and stretched. Lonesome doves began their love calls in the distance, beyond the back asparagus field. Pat liked to sprawl in the hammock in the grape arbor next to his Aunt Ruby's house and listen to the early morning and evening dove chat. He also heard his two older brothers talk on the other side of the arbor. Usually, his brothers whispered and ran off so he wouldn't tag along. Today they talked louder than usual and didn't run. He heard the word "snake". "Down under the cow shed an' he's HUGE! Me an' Bennie are goin' to try an' see him. He comes out about now," his oldest brother, Moe, said. "Can I go, too? ", Pat asked. "All right this time, but be quiet." 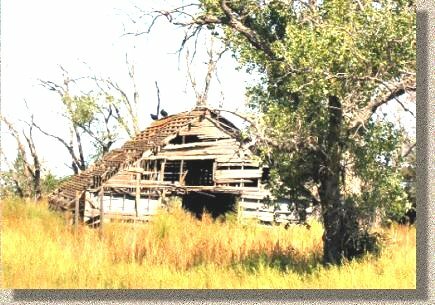 The cowshed stood on the right of the driveway, on its left an old truck rusted on flat tires. Dusty weeds grew tall around the truck and shed. The boys sneaked to the back of the truck and climbed in. "There he is!" Moe whispered. Pat peeked over the sideboard: "W-what's he doing with his mouth?" A little black "Y" flicked in and out of the snake's mouth. "That's his tongue, dummy—one stick with that an' you'd be dead inna minute," Ben said. "I'm goin' back." Pat's chin quivered as he ducked down. "No you ain't -- you wouldn't get ten steps, he'd catch up an' throw a loop 'round yer neck," Moe said. "Shhh—he heard you. He's lookin' right at us!" Pat grabbed the cracked sideboard and pulled up for a quick look. The snake stared at him. Pat shivered. He managed to let out a dry whisper, "I'm goin' back." A truck horn beeped up by the arbor. "It's okay now," Moe said as he stood up. "He ain't looking—when I say go, jump down an' run like hell!" Moe and Bennie snickered and ran toward the grape arbor. Pat brought up the rear. "Your folks are waiting," Aunt Ruby said, "Pat, you stay with me." The next morning Pat and Aunt Ruby walked down the lane toward the shed where asparagus carriers, crates and a wheelbarrow were stored. She opened the door that hung on rusty hinges. He never heard the door let out such a loud scre-e-e-ech. Aunt Ruby came out of the shed with two carriers and trudged toward the back field. Pat tiptoed behind her, looking over his shoulder. Aunt Ruby looked around. "Why are you walking like that?" "I don't want us to wake up that big poison snake under the floor of the shed." Aunt Ruby knelt in front of Pat. "Your brothers have been joshin' you again. That ol' milksnake's been down there a long time—he won't bother." "Oh, yes he will! One stick of his tongue an' I'd be dead in minute an' if I run he'll catch up an' throw a loop around my neck an' that ain't all—" Pat blurted out. "There's good and bad in the world, Pat. There's good snakes and bad snakes." Aunt Ruby stood, took his hand and they moved toward the back field. "That milksnake is a good one. No mice and rats in the shed while he's there. He's friendly an' likes folks. I bet you can make friends with that snake." Pat felt better after his aunt told him the about the milksnake. He would make friends with it. He went to the truck every evening after supper, but only saw the snake once. It inched out from under the barn while he peeked over the sideboard in the truck bed. The milksnake looked him in the eye—he bobbed down, reached a hand over the board and waved. A few days later, as Pat hauled the asparagus carriers in from the back field, he noticed his dad's pickup parked in the driveway. He went to the grape arbor, flopped in the hammock, picked up a dog-eared comic book and listened to his dad and Aunt Ruby's muffled mumbles from the house. His aunt shuffled out the screen door and over to the arbor. Her eyes were red like when her allergies flared up. "Here's nickel, Pat—go downtown to the Pollyanna Ice Cream Parlor and buy yourself a cone." "Oh, boy! I'll take the secret shortcut through the asparagus field—"
"NO! Take the path by the road until you reach the sidewalk to town. We've done it a hundred times. And it's too hot to run." rickety kitchen chair in the arbor and daubed at her eyes. "Pat, I don't want you or your brothers to play by the barn for a while." "Can I play in the truck?" "No, you are NOT to go by the barn if I'm not with you!" He never heard her sound angry before. Pat's dad had a job offer from a naval shipyard on the West coast at the beginning of World War ll and the family moved. Moe dropped out of school and joined the Navy during the war. Ben and Pat finished high school, Ben was drafted during the Korean Conflict and Pat joined the Army soon after and served a hitch in Korea. When Pat was discharged he went to visit Aunt Ruby. "I won't ask about the war, Pat." "Not much to say—you go, if you're lucky you come back and people think you've been away to college." Ruby stared out the picture window. "I thought about you when the bulldozer leveled the shed. That ol' milksnake that scared the wits out of you is under a ton of dirt now." "We made friends." Pat lit a cigarette. "Aunt Ruby, do you remember when I spent the whole summer at your ranch? I thought about it in Korea. Did something go wrong?" She pushed an ashtray toward him and wrinkled her nose. "You stayed with me because your mom was pregnant and I tried to help her out. Your parents didn't have money for doctors or the hospital. She'd been through childbirth three times and thought she and a neighbor lady could take care of things." baby boy was stillborn. No money for funerals, either." She folded her hands in her lap and sighed. "Your father brought the body to the ranch. We buried him by the barn." "You what?" Pat straightened and glared at her. "Was that the day dad turned up unexpectedly? You sent me downtown for ice cream cone – said I shouldn't play by the barn?" "Now don't go home and tell them I told you the story. It was a different time then and lots of things went unsaid." "For Chrissake! You buried my brother—in an asparagus crate, I suppose. Why didn't you tell me?" "I told you now—what good did that do? It was a different time, Pat." "Different time, all right." Pat looked down at his fist. "You get a new attitude about death after a few months in a combat zone. Now you tell me I have a dead brother buried under somebody's damned carport." The room darkened and Aunt Ruby clicked on a lamp. Somewhere in the house a clock ticked. Pat got up from the chair and started to put his jacket on. "Are you leaving? I hope you're not upset about our talk." "No, I'm not upset. Like you said, what good would that do? I have to be back at work tomorrow. I'll walk to town and catch the bus. Maybe have a beer at the Amble Inn—I'm old enough now." "Remember, we don't know who's under any carport." Aunt Ruby looked worried. Pat paused by the door and turned. "You just told me—the milksnake is under there. Goodbye, Aunt Ruby. " Pat took the new street that ran through the middle of the ranch, stopped for a moment at a carport where the barn stood and said something under his breath, then continued on to the main street. His old secret shortcut to town had painted crosswalks, streetlights, fire hydrants and dog barks. In town he stopped at the Inn, showed three pieces of ID, drank a beer—then went to the Pollyanna Ice Cream Parlor, now a real estate office, and waited for the nine o'clock Greyhound bus. He looked at dozens of snapshots in the real estate office front window of tract houses, all with picture windows and carports. An elderly man stood in the in the shadows of the doorway. "Waiting for the bus to the city, son?" "Me, too," said the stranger, "I love to ride the 'Hound, but I never sit in the back. I always sit up front and watch somebody else drive my life for a change—and I always look out the windshield. The future is just around the next bend in the road." The Greyhound bus pulled up, right on time. Pat and the stranger got on. They sat in the front seat of the bus and looked straight ahead . . .